This year I decided I would take part in the Tour de Fleece for the first time, so last week I was getting together my supplies. this is my biggest spindled skein yet! 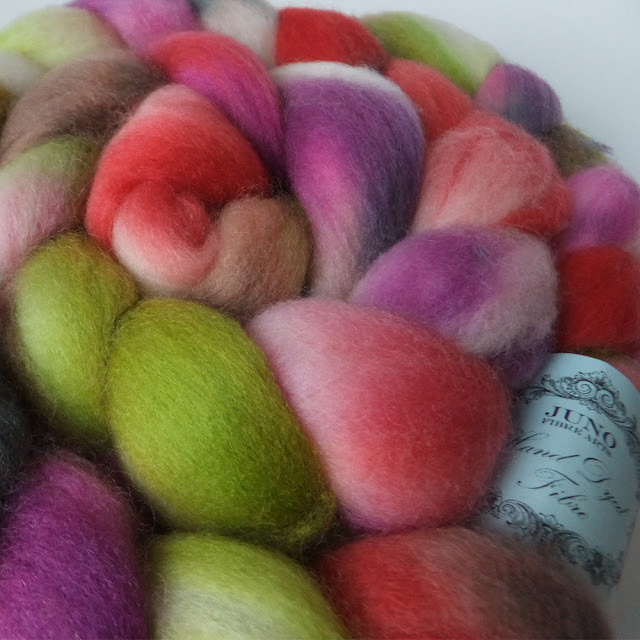 I hadn't spun with superwash merino before but as with all things from Juno it was an absolute pleasure to use. We are now on day 5 of the tour and this braid is now drying after its bath. The superwash merino definitely had a different feel to non-superwash, a kind of slippery smooth feeling which I guess makes sense as to make fibre 'superwash' the barbs are removed so they can't felt together. Next I am moving on to another superwash merino braid from limegreenjelly. I thought this one was so unlike my usual choice of colours that it would be fun to try. I can't imagine what the yarn will look like. Exciting!! 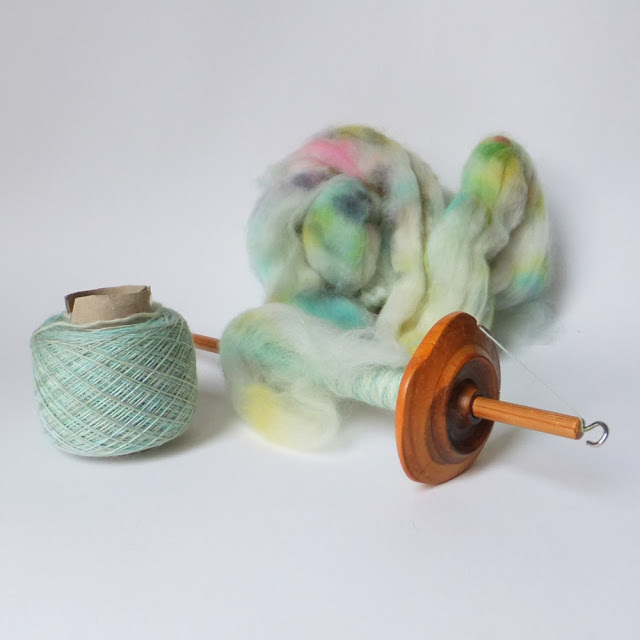 I'm joining in with the Spinning Show and Tell on Crafts from the Cwtch again this week so hop over there for lots more spinning loveliness. 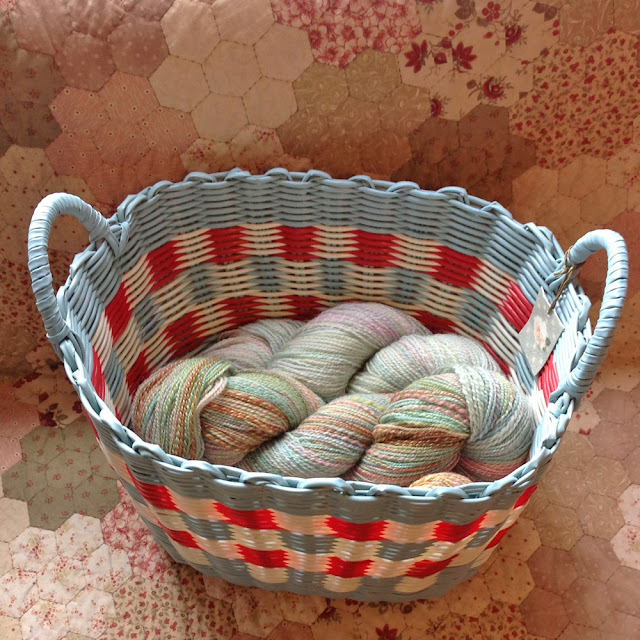 So are you joining in with Tour de Fleece and do you dream about baskets full of handspun too? *sigh* absolutely beautiful. Now to devise a cunning plan to pinch your basket of handspun!!!!! I have a little wooden 'basket' with my handspun in but it's not all pretty like yours. Must remedy this. Will try to remember to get a picture of it for you to see, in next week's post! I'll look forward to seeing your basket of handspun next week :) your spinning posts have really inspired me!